1) Heroes & Ghosts on pg. 243. 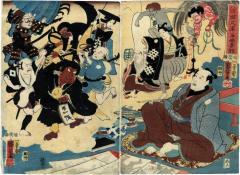 2) 歌川国芳展: 生誕200年記念 Utagawa Kuniyoshi: Exhibition to Commemorate the 200th Anniversary of his birth, 1996, #273, p. 188. There is another copy of this diptych in the Hachinohe Clinic Machikado Museum and the Ishibi Prefectural Museum.